When the original Blue Dragon title was released on Microsoft's Xbox 360 console, it became one of the system's first traditional RPG experiences. 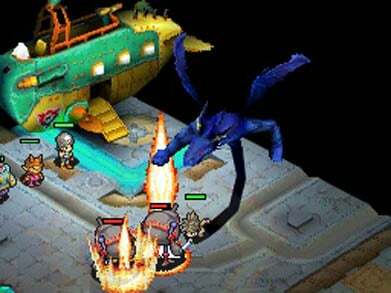 Blue Dragon captivated the gaming audience with its unique charm and epic quest, so it came as no real surprise that many fans of the game expected more of the same when developer Mistwalker first announced their plans to develop a new Blue Dragon title for Nintendo's DS system. 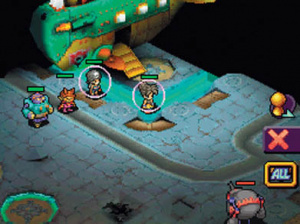 However, this was not the case: not only did the game lose most of its traditional RPG elements, it also took on the role of real-time strategy title in the process. 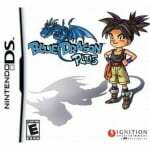 Unlike the Xbox 360 release, Blue Dragon Plus takes care of most of the actual progression of the game for you. The game lays out an ongoing storyline, complete with plenty of full-motion videos, and plonks your characters into various battle missions that you must carry out successfully in order to progress through the plot. You get given winning and losing conditions for each mission and then it's up to you to lead your party of characters to victory by commanding them effectively throughout each skirmish. You'll also have to learn your character's strengths and weaknesses – not to mention varying skill sets – if you're to be successful in some of the game's more difficult battles. For example, some characters are more prolific at carrying out physical attacks, whereas other characters excel at healing and support magic; it's up to you to figure out the best way to utilise each of the many characters in your party. The commandment of characters in battle is carried out through using the DS touchscreen and stylus: you can choose to control your characters individually, or even circle groups of them in order to be more efficient when directing them. All you need to do is point to the character(s) you want to use, then tap a spot on the touchscreen to order them to that specific point. Through this interface you'll also be able to select a range special skills, available to each character, that can be used in combat. Most of these skills will call into action your character's Shadow – a mythical avatar, which can perform devastating attacks on enemies when used correctly. 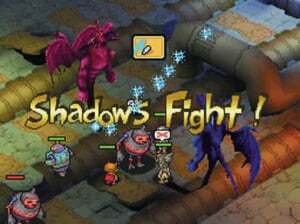 You'll have to be careful when doing this, because if you call out your character's Shadow at the same time your enemy summons his own, then you'll have to engage in a 'Shadow Fight' that requires you to quickly rub the Touchscreen with your stylus in order to make your Shadow grow larger. If you manage to make your Shadow larger than the enemy's, you win the fight and will inflict huge amounts of damage. If, however, you lose the fight, you will incur the massive damage yourself. It's small game play touches like this that can make the game such a strategic and enjoyable playing experience. Once you've progressed to a certain point in the game, you'll be given more freedom over how and where your characters moves: you'll be able to visit shops, where you can purchase better equipment and skills that you can assign to your Shadows; you'll have the opportunity to embark on side quests that can earn you special items and skills; and you’ll be able to design and build your own custom Mecha Robos in the Mecha Factory. These sections offer a bit more control and customization over the adventure, and will likely appeal more to the seasoned RTS crowd who like to get engaged in the in-depth aspects of the gameplay experience. The streamlined touchscreen controls lend themselves quite well to Blue Dragon Plus, and while the gameplay system isn't without a few minor flaws, the overall experience is pretty well done: you are offering with an intuitive control system that should be easy to pick up for fans of the genre. The lack of control over the various events during the first part of the game may be a bit tedious for those who like to micromanage, but this linear pacing doesn't last terribly long and does at least provides a gentle introduction before tossing the player into the deep end of the pool. The game could have used a couple of tweaks when it comes to how the player controls their characters in the heat of battle, but it's still a surprisingly enjoyable real-time strategy experience. The 3-D graphics engine used in Blue Dragon does a nice job: the visuals are smoothly animated in this nice and neat package. While you won't find much detail in the scenery, the characters themselves all look quite good, and the larger enemy characters you'll be forced to go up against are especially impressive. When scrolling and rotating around the various battle areas, you'll never run into any overly pixelated or jagged graphical elements, which is a strong positive. The full motion videos that Blue Dragon makes such heavy use of are also fairly impressive – especially for those who've not had the chance to experience much of it on Nintendo's DS system – which means you’ll never tire of the heavy doses of FMV present after many of the game’s battles. As if the solid visuals weren't enough, Nobuo Uematsu (of Final Fantasy fame) has composed yet another impressive RPG musical score. While not quite as aurally impressive as some of Square-Enix's more recent DS efforts, it's still extremely catchy and fits in perfectly with the action taking place on screen. The lack of any type of voiced dialog is a bit of a disappointment – especially considering how well it would have melded with the amazing full motion video – but with DS cart size limitations, not to mention well over an hour of full motion video on tap, perhaps there just wasn't any room left for it in the end. Real-time strategy games have exploded in popularity in recent years, so it's nice to see a noted RPG franchise modified to fit into the category – even better when it's done as tastefully as Blue Dragon Plus. Despite the few minor gameplay complaints, it's still difficult to fault the well-thought-out design that the game makes use of. It goes without saying that Blue Dragon is certainly worth taking a closer look at if you’re a real-time strategy fan. On the other hand, if you were expecting the same traditional RPG experience as the one found in the Xbox 360 original, this game may prove to be too radical a departure for you to fully appreciate. The gameplay is much different from the original but it was a necessary change and they seemed to have done a good job adapting to the platform. What is your opinion on Corbie's final score? Too high or too low? I played this and it seemed okay but I expected something similar to the original Blue Dragon. Why must all RPGs be made into RTS games like FF:Revenant Wings? Then again, when I was playing Blue Dragon on the 360 I really wanted it to be Dragon Quest instead! Bring on Dragon Quest 9! It's most likely another "7" comment. Oh and I second the "Bring on Dragon Quest IX" sentiment.